There are no economic reports in the Great Britain however the US is publishing Core PCE Price Index and Personal Income and Spending Reports. 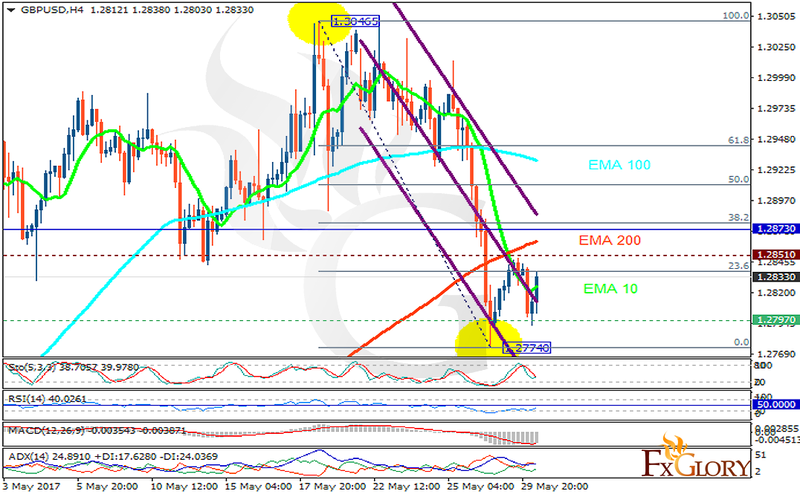 The support rests at 1.27970 with resistance at 1.28510 which both lines are below the weekly pivot point at 1.28730. The EMA of 10 is moving with bearish bias along the descendant channel and it is below the EMA of 200 and the EMA of 100. The RSI is rising towards the 50 level, the Stochastic is moving in low ranges and MACD indicator is in negative territory. The ADX is showing sell signals. GBPUSD has already started its correction pattern therefore the price growth will continue towards the 61.8 level of Fibonacci retracement.